Kevin was holding him on Sunday afternoon, and Tango just couldn't get enough ... so he gently reached out to Kevin's hand and pulled it towards him so that he could rub his face against it. It was a sweet and amazingly tender gesture, and we felt so lucky to have experienced it together! 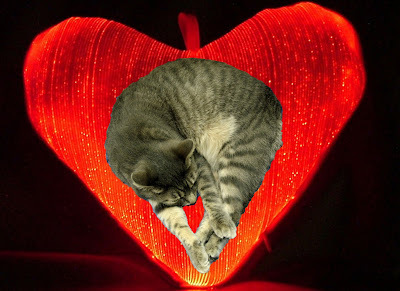 "Tango has nephrogenic diabetes insipidus. This means his kidneys do not respond to ADH (anti-diuretic hormone), which is produced by the pituitary gland in the brain and for which receptors are found on the kidneys. The function of ADH is to tell the kidneys to re-absorb water, but for whatever reason, the receptors on Tango's kidneys are not functioning. As a result, he loses quite a bit of water through his urine (this is why he drinks and urinates a lot). There is no medication for nephrogenic diabetes insipidus, and no way for us to get his kidneys to respond to ADH. But the bottom line is that as long as Tango has free access to water he will do just fine. He will always drink and urinate excessively, but this should not impact his lifespan or quality of life." Check out this adorable picture of our little buddy Jasmine. Isn't she cute? 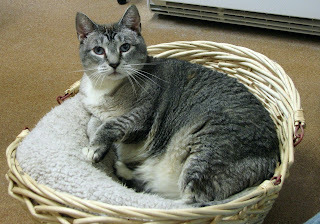 When Jasmine first arrived at our shelter as a kitten, it was clear she felt comfortable around other cats. But when it came to people, she wasn't so sure. Whenever we came into the room, she'd dash away to hide behind the safety of a cat tree, a piece of furniture, or anything else that served as a protective shield. But even though Jasmine was terrified of us, she never hissed or growled, and we never got the sense that she'd lash out if we tried to "push the envelope" with her. We're confident that this sweet girl will continue to blossom, and will do especially well in a quieter forever home. Sweet Roxy (above) and all of the other cats at PAWS (oh, and Tracey and Kevin, too) wish a Happy Valentine's Day to all of our furiends! 1. Each superior scribbler must pass on the AWARD to 5 friends who are also SS. 2. 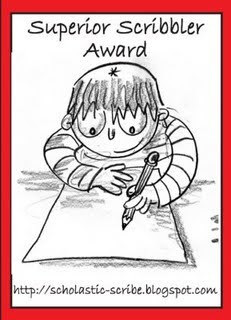 Each SS must link the author and name of the blog from whom he receives the award. 3. Each SS must display the award on his/her blog and link to the post which explains the award. (we couldn't find this post or the one where you have to add your name to the Mr Linky List. 4. Each SS is asked to visit the post which explains the award and add his/her name to the Mr. Linky List. 5. Each SS must post these rules on his/her blog. 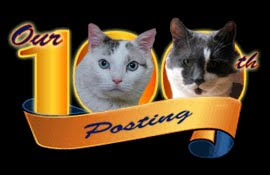 THANK YOU for being our friends, visiting our blog, and for all of your kind and encouraging comments. We appreciate you all, and look forward to sharing even more "tails" with you moving forward. Once upon a time, a nice young couple came to PAWS to find an adult cat of their very own. As they were escorted through the shelter's cat rooms, they met a myriad of adult kitties, including Chyna. The couple really liked our sweet Chyna, but ultimately decided to adopt Cyrus (another great adult kitty). It was a bittersweet moment ... we were certainly happy that an older cat was adopted, but a little sad it wasn't our dear, sweet Chyna. Especially because she had been at PAWS quite a bit longer than Cyrus. Could it be, we wondered, that Chyna was passed over because of her more reserved nature? We sort of decided then and there that we would try even harder to get this wonderful girl adopted as soon as possible, before she got too used to the shelter. Well, Chyna's luck took a turn for the better the very next day when a family came to the shelter looking for an adult cat who loved laps and quiet surroundings, but who would also do well with children. Who could possibly meet such a diverse set of criteria? Why, our Miss Chyna, of course! The rest, as they say, is history. Sunday was "I Love a Good Lap" Day! As always, we had a great time at PAWS on Sunday! Here are some shots of three of the kitties who love nothing more than a good lap.